That’s right, NewsBusters readers. According to two of CNN’s top personalities on Wednesday afternoon, you have contributed to our coarsening American discourse and tacitly deserve blame for the bombs sent to, among others CNN and former Presidents Clinton and Obama. 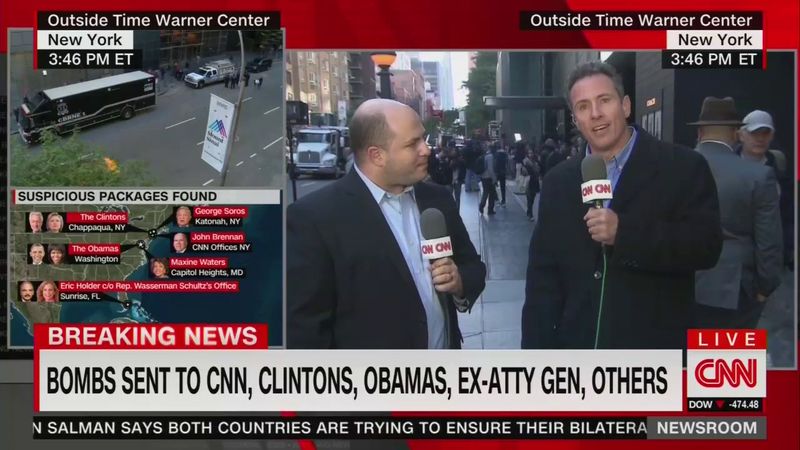 While reporting from outside the evacuated Time Warner building, CNN hosts Chris Cuomo and Brian Stelter asserted without evidence on those behind the bombs and heavy usage of the word “but” that it’s the President and “right-wing commentators” and “outlets” who should look at themselves in the mirror.